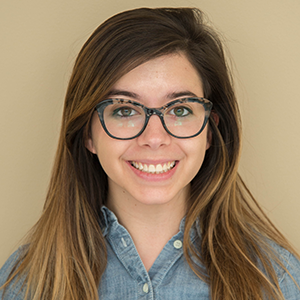 What do beer fermentation, soil analysis, and the production of dairy products have in common? They all involve the use of ion-sensitive field-effect transistors (ISFETs) for pH measurement. These sensors are small, efficient, and durable, which makes them suitable for food, environmental, and biomedical applications. However, ISFETs can experience drift and are sensitive to different temperatures, which limits their accuracy and stability. Using the COMSOL® software, engineers can accurately analyze ISFET designs and improve their performance. 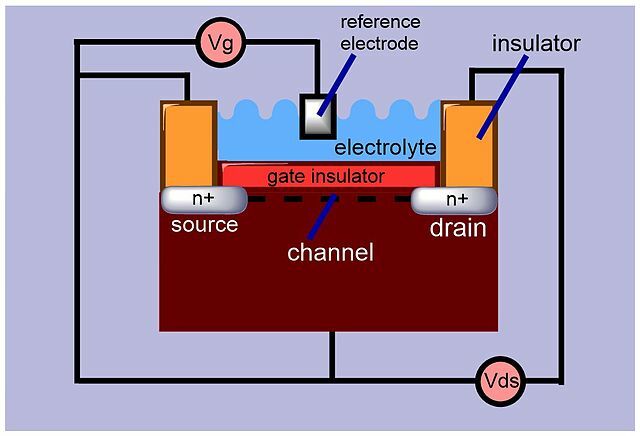 ISFETs are similar in design to metal-oxide-semiconductor field-effect transistors (MOSFETs), and they offer several advantages over other pH sensors. For one, ISFETs are made of silicon, hence they are more durable than other options, which are typically made of glass. This is especially advantageous for quality testing in the food, medical, pharmaceutical, and environmental fields, where broken glass could lead to contamination and setbacks. Schematic of a typical ISFET. Image by Huijunan — Own work. Licensed under CC BY-SA 4.0, via Wikimedia Commons. Though not shown explicitly in the drawing, the black wires are understood to penetrate the yellow-orange insulators to make connections with the n+ source and drain regions. Despite their many benefits, ISFETs also have a few drawbacks, such as drift and temperature sensitivity. They also have a limited dynamic range and can produce high levels of noise. In addition, the minimum voltage required for an ISFET to operate (i.e., the threshold voltage) can vary. These factors impact ISFET accuracy and stability and cause a need for frequent adjustments, which makes them unsuitable for biosensing applications (such as DNA analysis) and processing circuitry. In order to account for these factors, engineers must accurately analyze ISFET designs while taking into account the chemical reactions and electromagnetics phenomena, and more. The COMSOL Multiphysics® software, along with the Semiconductor Module and either the Microfluidics Module or a chemical engineering add-on module, provides features to do just that. For details on the available add-on products for modeling ISFETs, check out the COMSOL® product suite). The semiconductor domain is similar to that of a MOSFET, but an ISFET uses an electrolyte rather than a metal gate. The electrolyte domain contains hydrogen and hydroxide ions, in addition to a pair of generic anions and cations as in this similar model: Diffuse Double Layer model. You can find more information about this example in the Simulation of an Ion-Sensitive Field-Effect Transistor (ISFET) tutorial. The accompanying documentation provides detailed instructions for setting up and solving the model, and the MPH-file is available for download if you have a COMSOL Access account and valid software license. You can couple the semiconductor and electrolyte domains after modeling each domain individually. The electric potential from the electrolyte is applied on the oxide surface of the semiconductor domain, and the displacement field from the semiconductor side is applied on the boundary of the electrolyte domain. The electric potential in the ISFET. The resulting coupled system is nonlinear, so you need to use a series of studies to solve the problem. A fourth study is then used to show how the ISFET performs under normal operation, when a feedback circuit maintains a constant drain current. To save time, this circuit does not need to be modeled explicitly. Instead, you can use a global equation to simulate the effect of the feedback circuit. Starting with the study of the electrolyte domain, you can see the electrolyte potential along its center. The results can be compared to a 1D approximation formula (Ref. 1 in the model documentation). As shown below, the general curve of the results is in good agreement with the 1D approximation. 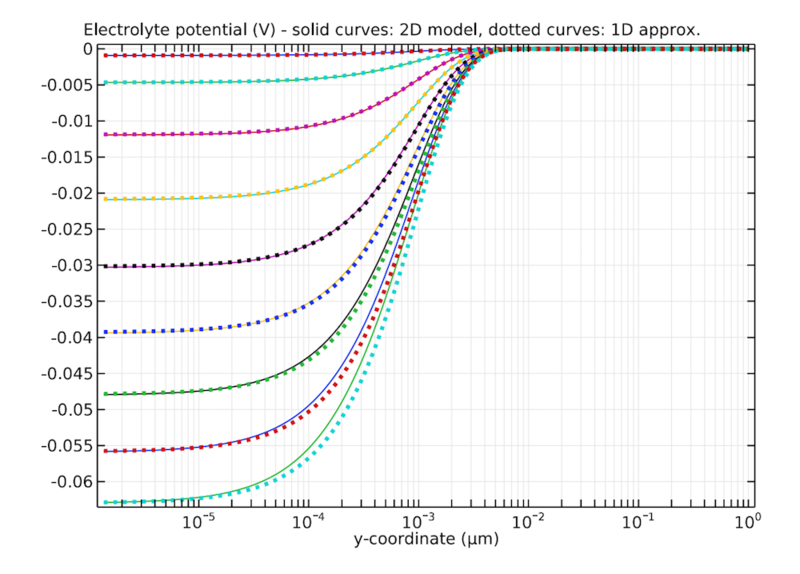 The electrolyte potential of the ISFET model (solid curves) and 1D approximation (dotted curves). Next, you can evaluate the operation of the ISFET. 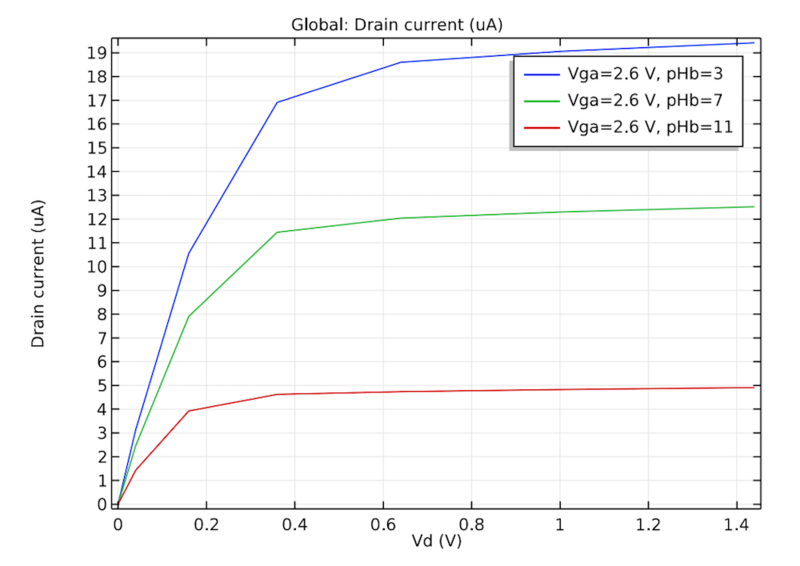 The left plot below indicates the response of the ISFET when the drain current is controlled by the applied gate voltage, while the right plot demonstrates the effect of three different pH values on the drain current-drain voltage curve, with the gate voltage fixed. These results help a designer to determine the best operating point for the ISFET. 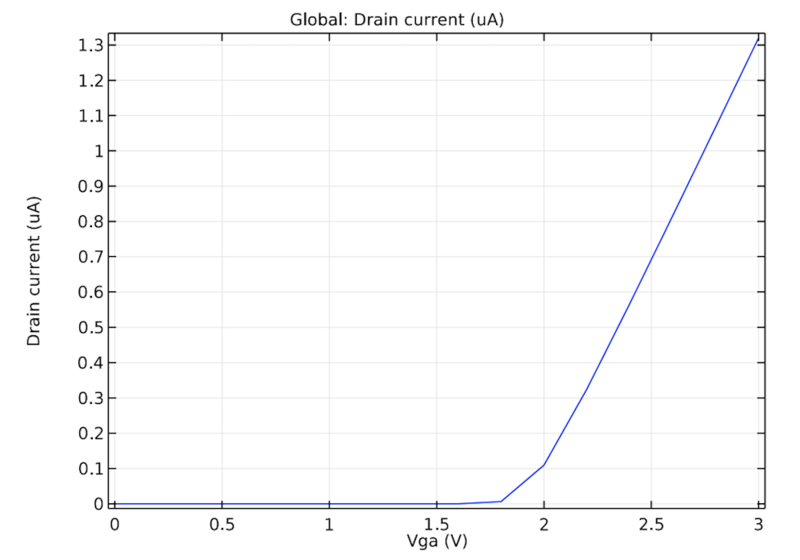 Left: The drain current of the ISFET as a function of the applied gate voltage. 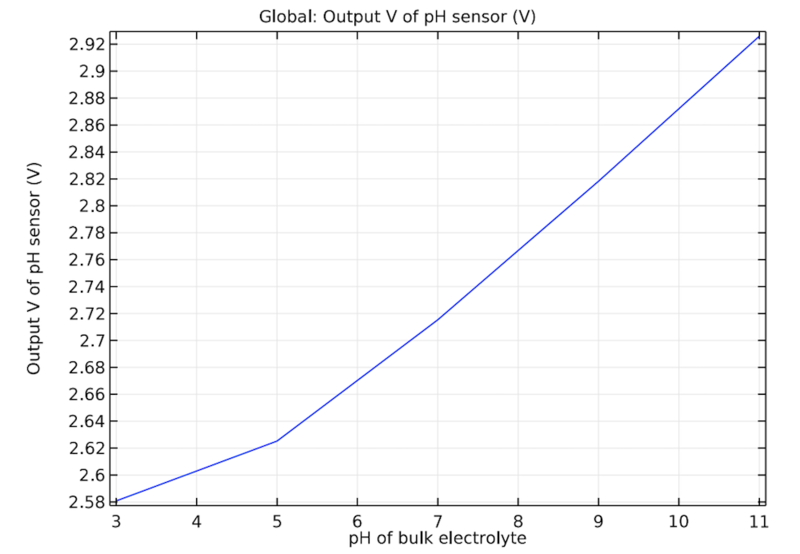 Right: The drain current for a pH value of 3, 7, and 11. Once the operating point is chosen, the sensitivity curve can be extracted by simulating the ISFET in the constant-current mode with a feedback circuit as described above. The slope of this curve matches that of the reference paper (Ref. 1 in the model documentation). The sensitivity of the ISFET. Using a model like this one, engineers can study ISFET sensor designs and improve their performance for various applications. 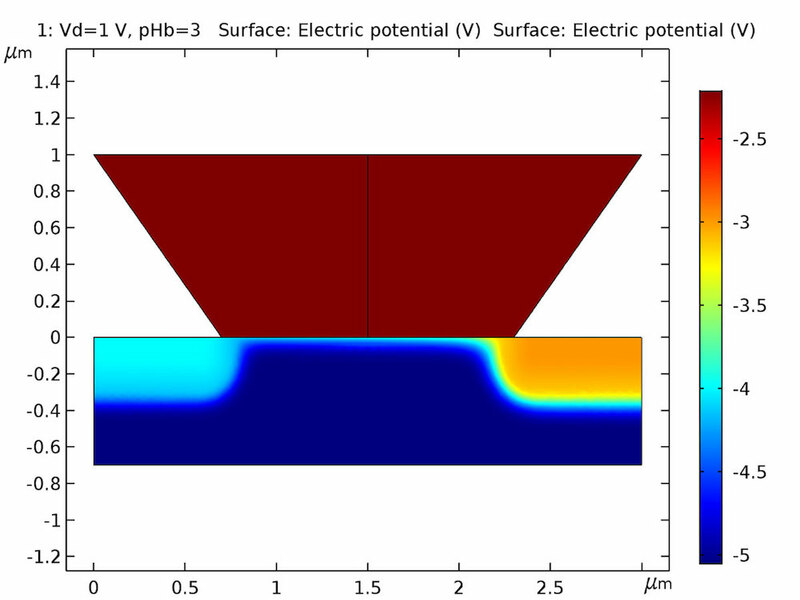 Want to try this ISFET model for yourself? Click the button below to head to the Application Gallery. There, you can find detailed documentation and the MPH-file for the example.